The historic Copper House is now up for sale. 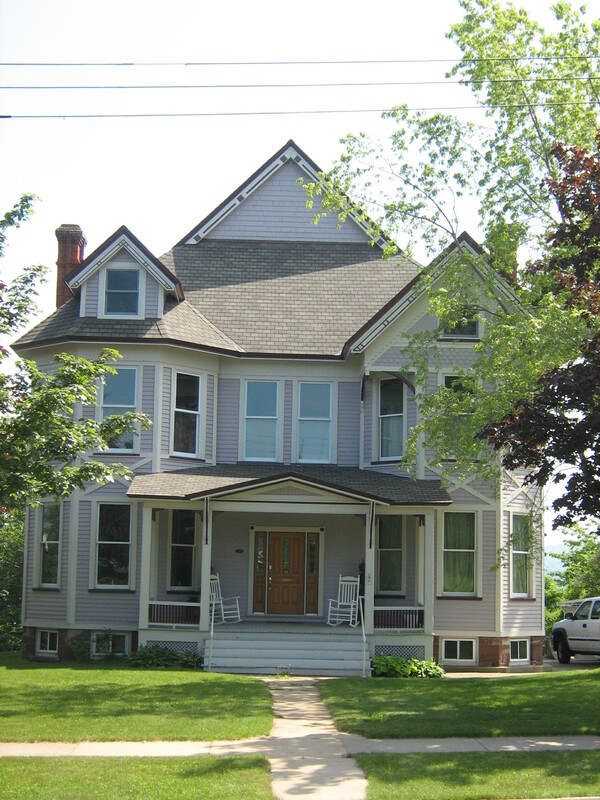 Built in 1905, this home has been known as the “copper house” because it is copper-plated. It was built for James Russell with profits from the Calumet-Hecla Copper mine. At the time, Mr. Russell was the warden of the Marquette Branch State Prison. The house next belonged to Myron Sherwood, attorney to John M. Longyear. The third owners were the Sloan family, and the fourth owners are Dr. and Mrs. Craig Stien. The following article is by Moire Embley, Director of Willpower, an original play I’ve written that will be presented at Kaufman Auditorium in Marquette on Thursday and Friday September 18 and 19. A sunny mid-August day in Marquette, Michigan, an operatic aria fills the air from a west side apartment. The melody is from an original composition, “You Will Not Love Me” for the upcoming Marquette Regional History Center’s new production Willpower by Tyler Tichelaar. The beautiful soprano voice of Sara Parks floats effortlessly along with piano accompanist and composer, Jeff Bruning. As Sara soulfully sings the repeated lyric “You will not love me; you won’t say why,” her character, Miss Norma Ross, comes to life. I have assisted and directed several plays in Marquette over the last fourteen years. 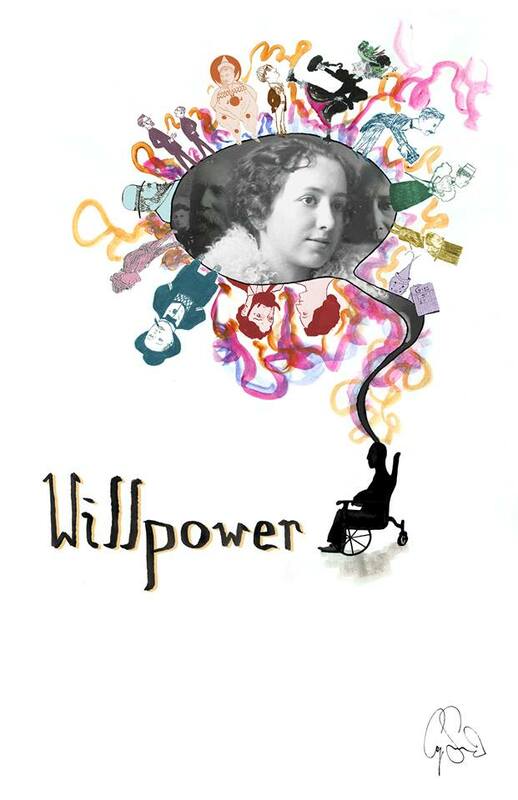 Willpower is one of the first original plays I have had the opportunity to be a part of. Last September, the Marquette Regional History Center’s Director, Kaye Hiebel, was scouting for a director and I was lucky to recommended by a good friend and mentor of mine. I came into the first meeting feeling slightly shy and a bit overwhelmed to be offered such a break as a director. I sat quietly in the large conference room surrounded by high-powered ladies, taking in the conversations, stories and ideas, which saturated the room. The focus was on a young man from Marquette in the late 1800s by the name of Will Adams. Will, I came to understand, was not your typical boy. Adopted as a young child by former Marquette Mayor Sidney and wife Harriet Adams in the early 1880s. Growing up at 200 East Ridge, the beautiful sandstone house, which is now known as the “Terrace Apartments.” As a youngster, Will sang in a boy’s choir at the St. Paul’s Episcopal Church, and was a noted athlete, artist and literary mastermind by the community. After suffering a severe baseball injury to his knee, an ossifying disease began to develop in his legs. As he grew, so did the disease, until it consumed his body, slowly turning his soft tissues to stone before he passed away at thirty-one. Will’s story is not a sad one, but one of love, ambition, community and courage. After leaving the meeting, I found myself eager and driven. This was a drama I needed to help tell on the historical stage of Kaufman Auditorium. Tyler Tichelaar a well-known local novelist, was hired as the playwright. After Tyler released the first draft of Willpower, I spent an entire road trip reading the play and then reading it again. Tyler’s use of public domain music was thoughtful and clever. His character delineations were accurate, concise and well researched. I could not put the script down. I became fascinated by his depiction of Will. Will was not the only character in Willpower to stand out. His caring childhood friend Norma Ross also captured my imagination. Norma and Will met as young children, and a friendship was nurtured by their shared love for music, theatre and literature. 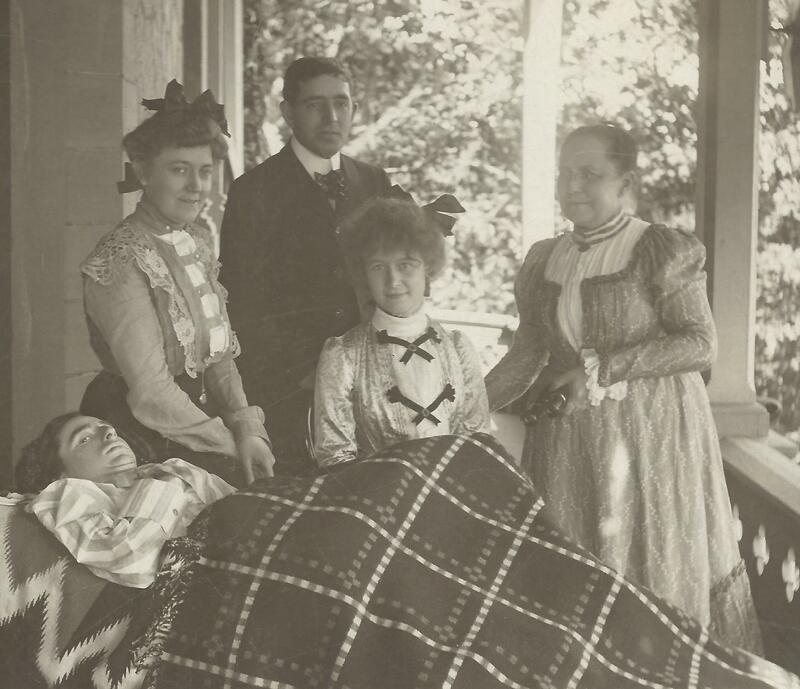 As Will’s disease became more debilitating, Norma would visit almost daily. They would pass the time singing to one another. When Will began to lose the use of his arms, unable to hold a book, Norma became his eyes and hands, reading aloud to him. After graduating from college with a degree in music from Northwestern University, Norma returned home to Marquette. Will, now in his late twenties, became fascinated with writing an operetta in which he enlisted the musical talents of his good friend. Norma and Will spent nearly three months preparing the lyrics and music. Will hummed the melodies as Norma played the piano, putting the music down on paper. Miss D.Q. Pons opened at the Marquette Opera House in the summer of 1905. The operetta’s success spread quickly, eventually touring to Ishpeming, Sault Ste. Marie, Hancock and Calumet. As I read the first draft of Willpower, I couldn’t help feeling that there was more between Will and Norma. I met with Tyler and Jessica “Red” Bays in mid January to discuss the first draft. I hadn’t met Tyler before and I was very nervous to discuss some edits I thought could be made. My approach was only to assist in using my theatre background to help guide the script to the stage. Some minimal character enhancements were made along with some plotline adaptations. Red and I left the meeting with Tyler more excited than ever. I felt he graciously considered my notes, however standing his ground on some changes. Between Red, myself and Tyler ideas bounced back and forth as we found our creative balance. Tyler quickly came back with the second draft. Every note we had discussed was in the script. Tyler’s attention to detail and respect for my creative vision as director was admirable. I frequently would tell him my job is to bring his story to the stage, but in a way I feel that this play is a collaborative effort between Red, Tyler and I. With only minimal edits to be made Tyler quickly moved on to the third draft. After the script became finalized, I searched for the best artistic staff I could find. Suzanne Shahbazi, well known for her work with the Lake Superior Youth Theatre, agreed to do costumes. 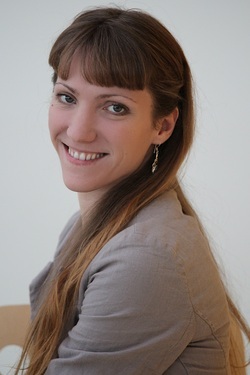 Jalina Olgren joined the production; she is one on the most talented stage managers we have in the Marquette community. Lastly, Jeff Bruning, a brilliant pianist, voice teacher and music virtuoso signed on. To round out the creative production team, Jessica “Red” Bays became my right hand, my support and promotional guru. Casting is always a wonderful process, offering a director a first-time glimpse into seeing the characters come alive. Within the two-day auditions and one day of callback auditions, I was blessed with an overwhelming amount of talent. I feel fortunate as a director to work in a community with high talent, quality vocals and acting ability. The final casting after auditions can be sometimes difficult. It is important undoubtedly to see a specific character within an actor. A director must also see that the character, small at times, be in the actor’s potential. 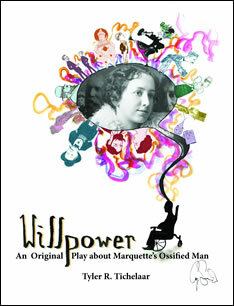 Although Willpower is a straight play, public domain music and old ragtime songs are used. This piano style popular from the nineteenth century through the early twentieth century gives the play a musical feel and also illustrates how music was an integral part of Will and Norma’s relationship. There was one piece composed for the play, “You Will Not Love Me,” by Jeff Bruning and lyrics by Tyler Tichelaar. Jeff wrote the piece, which captured the feel of the romantic ballads at that time. Tyler’s lyrics possess a witty touch, as if Will wrote them himself. The set design I will keep secret. I will only allude to my extensive research done at the J.M. Longyear Research Library. Using the expertise of research librarians Rosemary Michelin and Beth Gruber, the three of us spent hours hunting for Will and Norma’s past in genealogy files, photos, books, newspapers, magazines and plat books. I have great respect and gratitude for all the hard work Rosemary and Beth did for me. This play would not be what it is without their assistance. Directing Willpower has been an amazing experience thus far. I look forward to every rehearsal, researching each character and also learning more about the community in which I live. Willpower is a production that everyone can relate to, whether you are a history buff or a theatre and music enthusiast. It is a play that will warm hearts and tickle the mind. Please join us at Kaufman Auditorium on September 18th and 19th at 7:00p.m. For more information, call the Marquette Regional History Center at (906) 226-3571. Tickets are on sale at the NMU EZ Ticket Outlet or by visiting www.nmu.edu/tickets. This production is made possible by the Marquette Regional History Center and generous grants from the Michigan Humanities Council in addition to a matching grant from the Marquette Community Foundation and the Upper Peninsula Heath Plan. The Pendill Home at 322 E. Ridge St. in Marquette. 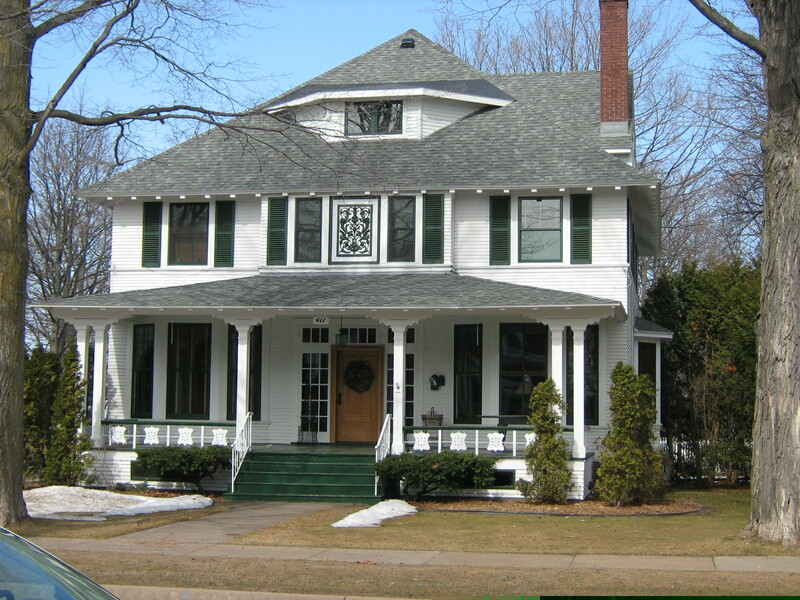 The first generation of Pendills in Marquette, James and his wife Flavia, lived in this beautiful home at 322 E. Ridge Street. James Pendill was born in New York in 1812, and after living in Niles, Michigan and Sault Ste. Marie, he came to Marquette in 1855. He was the representative for Marquette County in 1863-1864 and after moving to Negaunee in 1867, he became its mayor from 1872-1873. He is credited with being the father of Negaunee because he was responsible for laying out a plan for the city. He then moved back to Marquette where he was mayor from 1879-1882. He also was city supervisor for many years and a school board trustee. Mr. Pendill opened the Pendill and McComber mines, and he was also in the mercantile business and built many storefronts and homes and also operated a sawmill. Mr. Pendill died in 1885. The second generation Pendill home has a fascinating history as well. 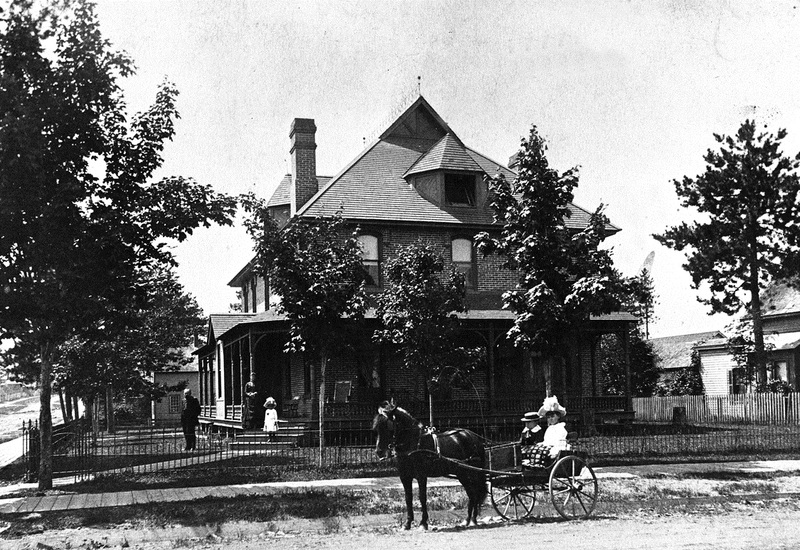 This house, built in 1878 and located at 401 N. Front Street, was home to James and Flavia’s son, Frank. Frank owned Pendill drugstore in Marquette, which operated for many, many years. His brother Louis also lived here and was involved in the drugstore. Later, their sister Olive lived here after her parents had passed away. Olive was a registered nurse who served in Cuba during the Spanish-American War. She later became the first superintendent of nurses at St. Luke’s Hospital, and she was the first historian of the Marquette County Historical Society when it was founded in 1918. She died in 1957 at the age of eighty-nine. Several visitors and owners of the house in more recent years have claimed to see the ghost of a woman in white inside the home, although it is unclear who the woman is. I recently spoke to one former owner who told me the ghost liked to move about items associated with St. Paul’s Episcopalian Church. In any case, the ghost is reputably harmless. If you’re looking to buy a historic home in Marquette, even if a haunted one, 401 N. Front Street is now for sale through Gina Feltner Bouws of RE/MAX. The house is listed at $209,900 and interior photos of it and further information can be found at RE/MAX’s website: http://global.remax.com/Detached-For-Sale-Marquette-Michigan_1024005003-108. You can’t beat the location, being within walking distance of the library, downtown, many churches, Third Street and Kaufman Auditorium. I wish you your chance to own a piece of Marquette’s history.